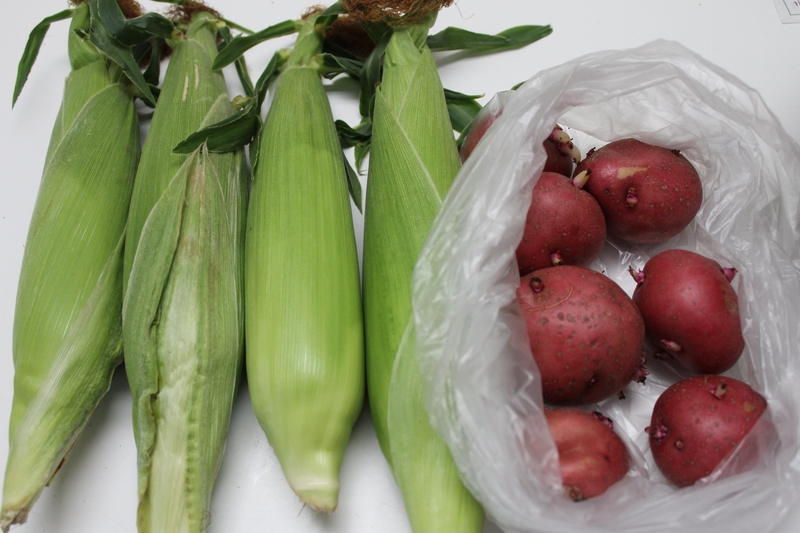 These photos reflect my typical haul at the farmer’s market (this is from July before our move). I have found that fruit is more expensive than veggies. 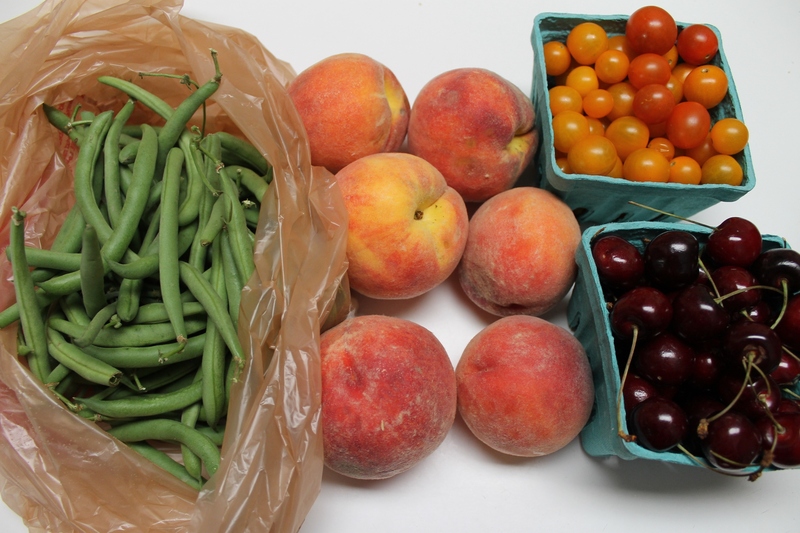 The peaches (above) cost $6 (my most expensive single item purchase) and the tomatoes and cherries were $5 each. With fruit alone I’m looking at an outlay of $16. Yes, I consider those tomatoes to be as good as candy…and fruit. While the green beans were a bargain at only $3. How do I justify “costly” fruit? Fruit is a snack, a lunch side, or a dessert, depending on the meal. For me fruit replaces salty, fatty, or sweet snacks that I like too much. Some vendors sell corn for $0.50 per ear. That’s $2 of corn. I need to write down how much everything is next time — I don’t remember how much the potatoes cost me. I’m going to say $4. 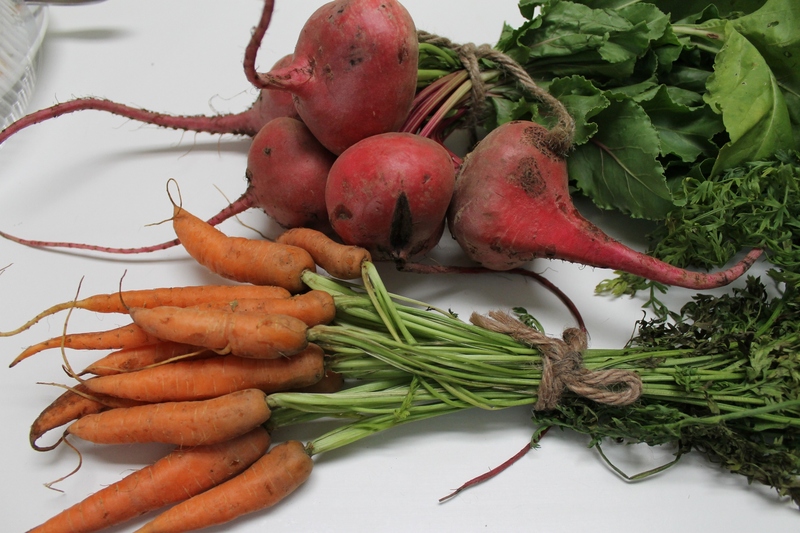 Beets are dirt cheap. I find them for $3 a bundle. Same for the carrots. I like to roast veggies, even in the summer. I love beets way too much. They are even better pickled. I haven’t been able to find a pickled beet vendor this summer, but if you find one at your market, buy a jar. I gobble them down. I guess I exclaim this is “to die for” a lot because Charlie will take a bite of something and say “this is to die for!” When I heard him say that the first time, I almost spat out my mouthful of food. We do enjoy eating around here. But pickled beets? They are “to die for.” Now I just need to screw up the confidence to learn how to pickle something! The produce works for multiple dinners and leftovers. Normally, fruit is a snack. Yep, I call that a bounty. Previous PostMrs Q’s News: Laws, Summer Food, and Teens in ActionNext PostTaking questions: Food Stamp Abuse? I always spend too much at the farmers market because I usually end up getting more than I need. Everything looks so nice!. I love getting beets at the market because the greens are attached and fresh. It’s like a second vegetable for the price of one. But even if I do spend too much I feel better knowing my dollar is going to a farmer. I tend to buy maybe one or two fruit items and a bunch of veggies (and I still spend $30-40 easily). Wow, you must live in an expensive area. Our farmer’s market here in North Alabama tends to be about half the price of what you’ve posted. I do love going though! If I don’t grow it in my garden, I can typically find it there! Beets rule. I rarely buy them at farm markets, though, because I’ve discovered a genius product at our local Fairway–vacuum-packed roasted French beets! Just roasted beets, nothing added, they are already mildly sweet in their own juice. Adding a tiny bit of vinegar would easily cross them into pickled territory. And they are not expensive, $1.50 for a small package of maybe 4 beets, and $3 for a package twice the size. No BPA-laden can, no heavy glass jar, they are vacuum sealed, so they don’t even require refridgeration until you open em. Plus I like not heating up the kitchen with all that oven roasting when it’s already sweltering outside. I eat the greens from bunches of radishes if they look fresh and haven’t gone wilted or slimy. Radishes must be grown in sand or something, because I find there’s always a fair amount of grit to be washed off the leaves. Radish greens can be very very bitter, so I prefer them cooked, and even then I’m not always enthusiastic about how they taste, but I always feel terrific after I eat them — it must be all those beneficial phytochemicals coursing through my veins! Fruit is expensive at our Market as well. I will say that our cherry/grape tomatoes are cheaper, $3. One booth we have is actually ran by an Amish farm and the veggies from there are the best. Our typical buys are tomatoes, lettuce, potatoes, zukes and squash. I usually try to limit us to $15 or $20 a week. It’s way too easy to go overboard. Our splurge item is local honey. I don’t like honey but find that it helps with my allergies if I put it on my pb toast in the morning. I have bought carrots before but I kind of freaked out because they were limp by the time we got home that day. Does anyone know if this is normal? All in all your “haul” looks yummy! Thanks for sharing. My farmer’s market is about the same as yours, in terms of prices, I think. Fruit is always more expensive than veggies, but I’ve also found that the produce is a mixed bag in terms of quality. For example, I think the corn crop this year around us just wasn’t very good, but farmers are still bringing it to the market to sell. We got some very skinny, shriveled up ears out of the deal, at $1 apiece. Not a good bargain when an edible ear of corn at the grocery store was about half that. I’m not sure about beets, but you can definitely find a lot of good, easy pickling recipes online. I’ve made bread and butter pickles using nothing more than a plastic bowl in my microwave and a recipe like this one: http://allrecipes.com/recipe/microwave-bread-and-butter-pickles/ Don’t be scared of pickling! You might have most of the ingredients on hand already. This depends on what part of the country you are in. Here a small bag of cherries or other fruit treat, can cost $10 from our farmers market. The people watching budget cannot afford to shop there, it is more of a novelty for those with some extra money.